November is the month for everything pumpkin and I tried some fun recipes one of which is Pumpkin Bars that turned out to be a super moist, melt in your mouth dessert that everyone in my family asked for seconds and thirds on. Pumpkin Bars are a sweet blend of pumpkin, cinnamon, and a cake like texture, topped with rich cream cheese frosting and is simple to add impressive but quick decorations to. I know I said that my Cream Cheese Pumpkin Bread was amazing but these Pumpkin Bars are a whole new kind of amazing. 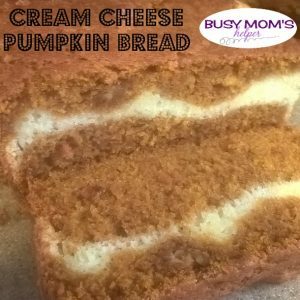 The bread was great and worked perfectly for a quick breakfast and such but the Pumpkin Bars are an amazing dessert to impress even the pickiest eaters. Mix together the eggs, oil, sugar, and pumpkin in a mixer. Pour batter into a greased and floured 18” x 12” jelly roll pan. Bake for 30 to 40 minutes or until toothpick inserted comes out clean and the bars start to pull away from the edges of the pan. When the Pumpkin Bars are cooled make the cream cheese frosting. Mix all cream cheese frosting ingredients except the powdered sugar well. Slowly add in powdered sugar and mix until fluffy. To make a cool design dump some cinnamon onto a plate. Get any cookie cutter, preferably small, and dip into the cinnamon. Gently press cookie cutter into the pumpkin bars to make a design. 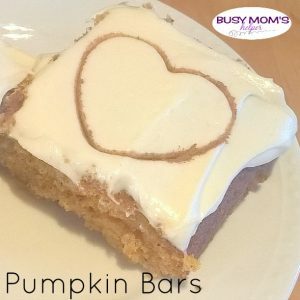 These Pumpkin Bars were amazing but did take a little work but don’t let that scare you away trust me, I’m working on a post with pies and wow, those are hard. 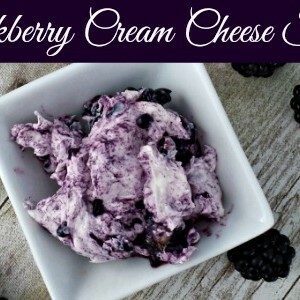 This recipe is a little long but completely worth it and the steps are pretty easy just mainly mixing. I hope this recipe helps out with all your holiday plans and adventures. Life’s busy, right? Kids, school, work, house chores, cooking – okay, I better stop before I start to cry! Anywho – we need all the help we can get, such as some genius snack hacks. Well right now Farm Rich is having a Back Your Snack contest – so it’s the perfect time to create your own snack hack recipes, plus vote on others! One of my newest favorites that my family has enjoyed are these BBQ Chicken Bombs – delish, quick and only 4 ingredients. That’s what I call a winner! We often use tasty snacks like Farm Rich products to make the after-school rush a little easier, plus it’s so easy to get a variety! For the Chicken Bombs, I just grabbed their Boneless BBQ Chicken Bites in the frozen section at Walmart, a few other items, then whipped it up really quick before the kids got home. It was a hit! Preheat the oven according to Chicken Bites instructions and bake as directed – without using the BBQ sauce packet. In the meantime, spray or line a baking sheet and spread out the biscuits or crescent rolls. Spread some of the BBQ sauce from the packet on each biscuit. Mix the cream cheese and green onions well. Place a small scoop on each biscuit. When the chicken bites are ready, place one inside each biscuit and wrap up, pinching the edges closed. Bake according to biscuit package directions. Allow to cool a bit and ENJOY! Another thing I like about Farm Rich is how easy it is to get the different things ready – then I can offer a variety to my kids, and they have fun picking and choosing their own snack mixes! I sometimes make yummy sauces or dips to go with, and always offer some fresh produce, as well. 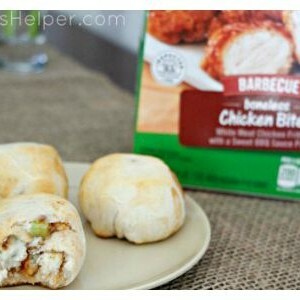 As amazingly yummy as these BBQ Chicken Bombs are, I bet YOU can do an even better snack hack for the contest! For all of the details, check out the rule book HERE. To see a list of stores where you can find upcoming demos and even vote, see HERE. Semi-finalists voting will be on September 19th and 20th, and finalists on October 9th and 11th. The winner will receive $10,000! Plus 5 winners from the voters ‘sweepstakes’ will get a prize pack containing all of the following items: a tote bag, a meat thermometer, grilling tongs, an oven sheet, an oven mitt, $50 worth of Farm Rich product coupons and a $50 Walmart Gift Card. The ARV of each Sweepstakes Prize is $140. Total ARV of all Sweepstakes Prizes is Seven Hundred Dollars ($700.00). So be sure to opt-in for the sweepstakes when you vote in-store! What Farm Rich product will YOU use to create your own Back Your Snack creation?